Employees (and their immediate families) of the Promoter, Cerrone Jewellers and agencies associated with this promotion are ineligible to enter. Immediate family means any of the following: spouse, ex-spouse, de-facto spouse, child or step-child (whether natural or by adoption), parent, step-parent, grandparent, step-grandparent, uncle, aunt, niece, nephew, brother, sister, step-brother, step-sister or 1st cousin. Promotion commences 9:00am AEST on 15/04/2019 and closes 11:59pm AEST on 19/04/19 (“Promotional Period”). 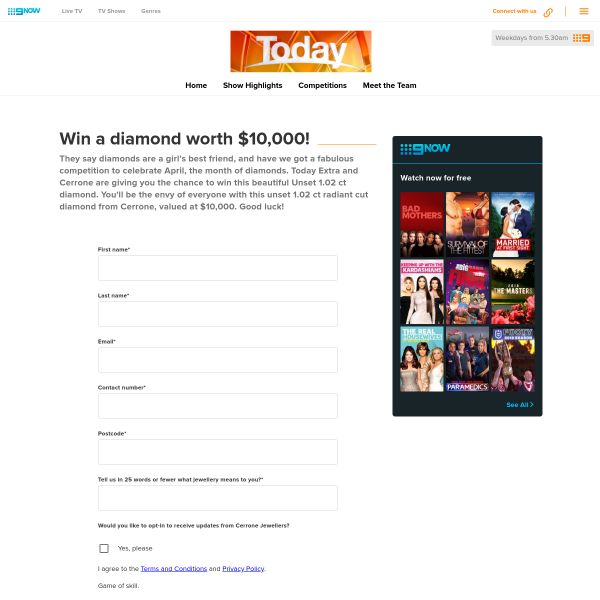 To enter, eligible entrants must, during the Promotional Period, visit www.todayshow.com.au, locate the promotional entry form, complete all requested details including full name, contact number, a valid and current email address, postcode, and an answer to the question “Tell us in 25 words or fewer what jewellery means to you?”, and submit the completed form. The judging will take place at 24 Artarmon Road, Willoughby NSW 2068 on 22/04/19 at 10:00am AEST. The judges may select additional reserve entries that they determine to be the next best, and record them in order of merit, in case of an invalid entry or ineligible entrant. The winner will be notified by telephone and email.